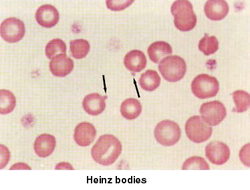 Glucose 6 phosphate dehydrogenase deficiency anemia is identified by the present of bite cells and Heinz bodies which is oxidized hemoglobin that clumps within the red blood cells based on the finding on the peripheral blood film/peripheral blood smear. Heinz bodies will lead to the destruction of the red blood cell membrane and the red blood cell will be removed by the spleen. Glucose 6 phosphate dehydrogenase deficiency is commonly affecting african american and it is an X linked recessive disorder. Glucose 6 phosphate dehydrogenase is an enzyme which involve in the production of NADPH in the hexose monophosphate pathway. NADPH involved in the production of the reduced glutathione. Reduced glutathione will increase the chances of the hemoglobin to be protected from oxidative damage. There will be an oxidative hemoglobin damage in case of deficiency of the glucose 6 phosphate dehydrogenase. It is advisable for the patient who suffer from glucose 6 phosphate dehydrogenase deficiency anemia to stop the intake of any oxidant drugs such as quinine, primaquine and sulfonamides. 1.Beutler, Ernest. “Glucose-6-Phosphate Dehydrogenase Deficiency.” In Hemolytic Anemia in Disorders of Red Cell Metabolism, 23–167. Topics in Hematology. Springer US, 1978. 2.Mehta, Atul, Philip J. Mason, and Tom J. Vulliamy. “Glucose-6-Phosphate Dehydrogenase Deficiency.” Best Practice & Research Clinical Haematology 13, no. 1 (March 2000): 21–38. doi:10.1053/beha.1999.0055.